Welcome to Podcasts.ie a free, Irish, audio podcasting site featuring exclusive interviews with and performances by Irish writers of poetry, prose and music as well as Irish culture and heritage including Myths and Legends and People and places. We also have lots for you to listen to as we open the archives of our production company All Points West Audio Services, including radio programmes from the past and some of the documentaries and radio dramas we have produced with many programmes unique to Podcasts.ie. 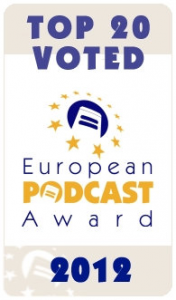 To navigate the site simply use the drop down menus above or visit the pages using the colum marked ‘Our Podcast Categories’. You can listen on line and continue to surf the web or you may wish to download each file to your computer and transfer it to a portable media player to enjoy later. 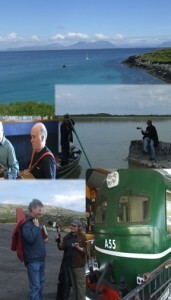 Audio content on Podcasts.ie is free for you to listen to when and where you like, your own personal slice of Ireland. To to find out how you can sponsor or advertise on one of our podcasts or to discover how we can help you to can make your own podcasts for inclusion on Podcasts.ie or on your own website click here. Please note that our featured writers podcasts are not available for sponsorship at this time. I left Ireland back in 1986 and have only been home once since, podcasts.ie has brought me home again. I love The Calender road, just wondering if it any where near Bishopstown in County Cork, it sounds so like the roads I walked as a young man. Keep up the great work ! a lot of similarities with other roads – thanks again. nice site and easy to navigate. I will have to bookmark this site. Delighted to see this imaginative and creative site up and running. Congratulations on the initiative and good fortune in its development. At a time when government is attacking everything, and Arts Council moves a blinkered policy, it is heartening to see your commitment and support. Like a good wine, gets better with age. No toe tapping or raucious hand clapping. Just good, late night, easy listening. The Cork International Airport Hotel welcomes Podcasts.ie to Cork. Hope you both enjoy your stay and looking forward to hearing all your poems and stories over the coming week. …nice site…both concept and content…. Wonderfull site i can listen to it all day.I have bookmarked the site for regular listening. Great site, thanks for the wonderful music. love the translator on your website but why is Irish not among the languages on it? you have obviously gone to a lot of trouble to provide translations on a wide range of languges for evey word in the text surely one more wouldn’t have been that much trouble. i would be interested to know what the rationale was for not including it? Nice site to be on, I’m leaving for Scotland and Ireland this coming Sunday the 5th of September. I’m looking forward to seeing Ireland once again. Les Redding,Prince George British Columbia, Canada. I’ve been searching in google for some home and garden ideas and occasionally found your http://www.podcasts.ie web site. Great post, I just bookmarked your site and I’ll definitely return again. I’m impressed, I have to say. Really hardly ever do I encounter a site that’s both educative and entertaining. Your concept is outstanding; I’m very happy that I stumbled across this in my seek for one thing referring to this. Some really superb content on this site, appreciate it. It is rare for me to find something on the net that’s as entertaining and fascinating as what you have on your website it is really awesome. You’re definitely one in a million, great job! I had never heard of this site until Michael Pattwell told me about it. Now, I realise that I’ve been missing out! This is a great idea and a great site! Simply wanna input that you have a very decent internet site , I like the layout it actually stands out. Hello, I found your page through bing and hope you keep providing more quality podcasts. Great website, brings the exiled together. Admiring the hard work you put into your website and detailed information you provide. It’s good to come across a site every once in a while that isn’t the same outdated rehashed material. Wonderful stuff! I’ve saved your site and I’m adding your RSS feeds to my Google account. Wonderful site that has kept me enthralled for hours. Congratulations and well done! Iontach/ wonderfull as usual. Love the Irish. very good , as usual. Fantastic site & so well put together. Will most certainly tell my friends about this. Keep up the good work. I am delighted to be able to share your podcasts with a wider audience and hope that it brings more and more people to hear your great work already. The mix of reading, along with music and nature and the quality of your podcasts brings me right into the places with you. I listened to one of your featured authors, Alice, and I look forward to reading her book and I’ll have her voice in my head to help bring it to life more. What a wonderful way to be introduced to an author and her writing. I just can’t say enough great things about your work and I look forward to exploring more and more. Fiona you are very kind and we are delighted that you have spotted what we set out to do, put the authors voice into the heads of the visitor. That was one of our biggest motivators for starting the site. We are thrilled with the response we have had from your Facebook page https://www.facebook.com/pages/Podcastsie/363241586788?ref=hl#!/TheIrishWay?fref=ts and that such a chance virtual meeting has brought us in contact with a fellow kindred spirit. I absolutely love this site and cannot recommend it highly enough to all. It is run by the some of the most genuine and helpful people I have had the pleasure to meet. I wish you all the continued success you deserve. Just a quick note of thanks to the professional team at Podcasts.ie – I’m delighted with the fabulous quality of my Cinderella’s Smile podcast on your site – I wouldn’t have believed I could sound that good! That is very kind of you to say so Susan but you must take some of the credit yourself, we are not miracle workers. Wonderful site and podcasts. Thank you for making this available. The Irish Wattle An excellent site exploring Australia’s Irish Ancestry.